After The Viral Fever Youtube channel, if there is another channel that is close to it in terms of popularity among masses, it is AIB: All India Bhakchod team. I completed watching their 3 part web series named "Honest Bars and Restaurants". I was unable to understand by the title what exactly AIB would have done to make it comical but after watching all the three parts, I found it one of the most intriguing series on the Indian web channel. 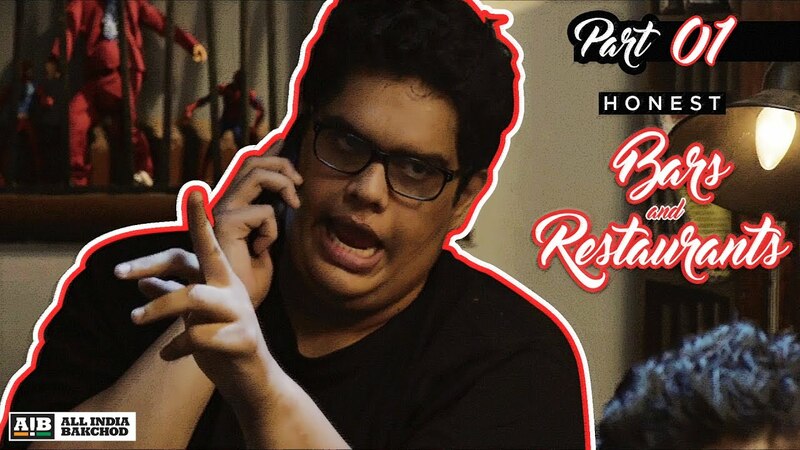 AIB is the team of hardworking and creative guys who assure that whenever they come out with a video, you have few moments of laughter indeed. The first episode of HBAR is about how when you ask your friends what they need from the restaurant they end up saying "Nothing" but after the restaurant picks up your call, all the friends start adding their dishes to the order placed initially by you after which it becomes so confusing that neither you know what all have been ordered nor the guy on the other side on call. A nice rap has been played while the order was been given by Tanmay Bhatt who is also the one who is leading this series. The second part in the first episode is how the guy who is leaving the college has come to the small dhaba-type corner outlet to settle his bills. That's the best part in this series and it made me laugh so much at the over-exaggeration of the scenario. And the Kabhi Khushi Kabhi Gham's background music just adds the amazement to it. The second episode shows how a middle-class family orders in a restaurant and the interaction between the family and the waiter does it for you this time. The hilarious moment is when the family orders Butter Chicken and the waiter says something like ""hum baaki kuch rakhte hi kyon hai menu mein". The great part about the whole series is that its based so much upon reality that you can relate with it very easily. The third episode is all about how some friends are shouting and troubling all the other customers sitting on nearby tables. Also it shows how it is pre-assumed by everyone in the group that the boy who has a girl with him will pay the bill for all.